The above chart shows how consistent this pattern is from 1985 – 2008. 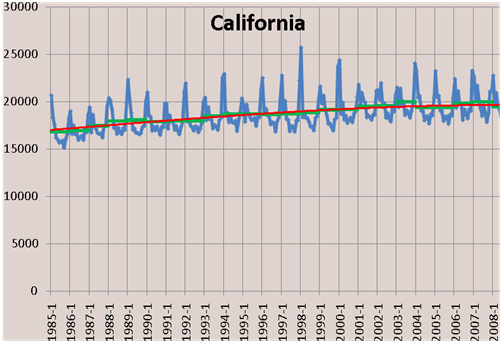 The blue line plots monthly deaths as measured by the y-axis, starting with about 200,000 in January 1985. They show an unbroken pattern of deaths peaking in the winter and bottoming in the summer. The green and red lines are simple and weighted averages that smooth out the lines to show the change in annual deaths over time. Is this seasonality experienced in every region of the U.S.? Are different regions of the country, with milder seasonal weather fluctuations, immune to the overall seasonal death trend? One look at California (below) tells us probably not. In fact, this seasonal pattern of deaths by month is the same in California, Florida, Illinois, New York, Pennsylvania, and Texas. It is important to note that this does not mean that every single locale across the country will experience similar monthly patterns. In any given market, the smaller the population size, the greater the variability it might see, and the greater the likelihood that the seasonal pattern in any given year could deviate from the nationwide or statewide trend. But overall, this seasonality is a well entrenched phenomenon. Once people become aware that death has a bias toward winter, some speculate they know one reason why – suicide. After all, it is the dark, cold nights of winter that push people “over the edge,” or perhaps holiday season blues. It turns out this is a myth. Suicide is actually one cause of death that has a slight bias toward summer. (And, it turns out, Mondays.) Facts are powerful things. Understanding such underlying drivers helps one appreciate the predictability of overall seasonal death trends. Source: ICPSR, Inter-University Consortium for Political and Social Research (www.icpsr.umich.edu), 2007. Our analysis revealed that many causes of death in the U.S. exhibit seasonality in a “U”-shaped pattern with the most deaths in the winter and the fewest in the summer (Group 1). I won’t attempt to provide the medical explanation for the seasonal patterns of each cause of death, but we all know for example, that Flu strikes hardest in the winter months. Some causes of death do not exhibit any seasonality. These include Cancer, Assaults, and Infant Deaths, defined as Group 2. 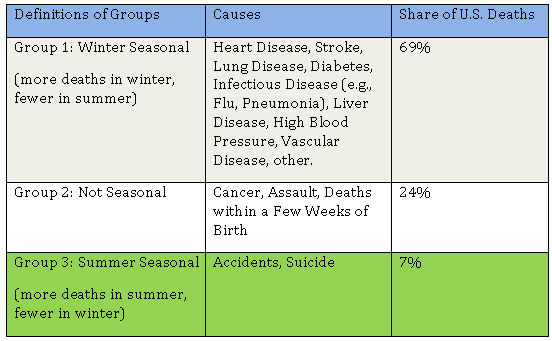 Group 3 has seasonality, but in the opposite way – more deaths occur in the summer, and fewer in the winter. Suicide and accidents are included here. Taken together, death appears to be seasonal with a bias toward winter because more types of death are seasonal with a bias toward winter, than are neutral or with a bias toward summer. We could spend more time investigating why certain conditions result in higher winter mortality, but this feels like a topic for a different blog, at another time, and by a different blogger than me. My goal here is to help all those out there who have debated whether or not more people die in January – they in fact do – and to raise a glass in the direction of Mr. Anthony Trollope, who implied that seasonal mortality drops measurably by about May 7th of each year. It turns out he had that generally right. This entry was posted in Ask the CEO and tagged CEO, Life at Legacy.com, Obituaries, Stopher Bartol. Bookmark the permalink.